What is Unique About Dr. Miller’s Practice? Dr. Miller is a traditionally trained physician (Medical Doctor). His practice is focused primarily on his subspecialty, Mind-Body Medicine, a strategy for delivering health care that focuses on healing and wholeness at the systemic level. His focus is primarily on skills, not pills. The Mind-Body approach differs from that of “mainstream medicine” in several ways. First, it extends the role of mainstream medicine by treating not only the physical illness, but also imbalances at the emotional, cognitive (mental), relational (relationships), and spiritual levels, since these imbalances are often the true source of the symptoms being treated. In order to accomplish this, Mind-Body Medicine makes greater use of psychological, meditative, deep relaxation, and hypnotherapeutic tools along with any pharmaceutical and surgical interventions that may be necessary. Mainstream medicine has excellent tools for dealing with the treatment of acute injuries, infections, and other urgent physical situations, and is usually the treatment of choice for them. Dr. Miller’s instruments are not scalpels and drugs, but words and experiences: images, memories, cognitions (thoughts) and emotions. In addition to treating individuals, he also sees couples, families, and teams, depending upon what is needed. During your first visit to Dr. Miller, he will take a careful history of your primary problem and of your general health history. After gaining a preliminary diagnostic impression, he maps out a plan for correcting the imbalances found. Among the tools he utilizes to bring about healing and positive change are cognitive behavioral techniques, meditation, and hypnotherapy. The “healing state” produced by deep relaxation renders the unconscious levels of the mind and nervous system open to receive guidance from you. This guidance is applied through the use of guided imagery, a powerful technique you will learn for rewiring your brain and nervous system. Recordings of Dr. Miller’s voice guiding you into these states and offering the new “Software for the Mind” are made at the time of your visit. Sometimes rapid relief follows, but in most cases it is suggested that you continue to practice daily for a period of days or weeks with these recordings made especially for you. Guiding your mind through this mental workout strengthens your “mental muscles,” programs the new patterns into your mind, and makes them permanent. 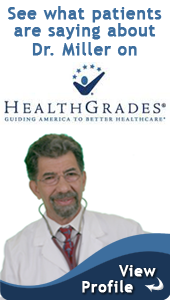 Dr. Miller also offers the benefit of his more than 45 years of practicing holistically. The experience, knowledge base, and wisdom gathered help bring his patients to a deeper understanding of how mind, body, emotion, and spirit can work in harmony to produce healing, balance and wellness in their lives. His aim is to provide self-applied mindtools with which to bring this about and to help avoid other imbalances and illnesses in the future.